For the main description of the hill, see NS3779 : Ancient hill-fort on Carman Hill. These boulders lie within the fort's outer enclosure. Long before the fort itself was discovered, the hilltop, with its prominent boulders, had figured in local legend (NS3779 : View over ancient hill-fort), as had NS3679 : The former Fairy Knowe Quarry at its foot (see NS3678 : Carman Quarry). 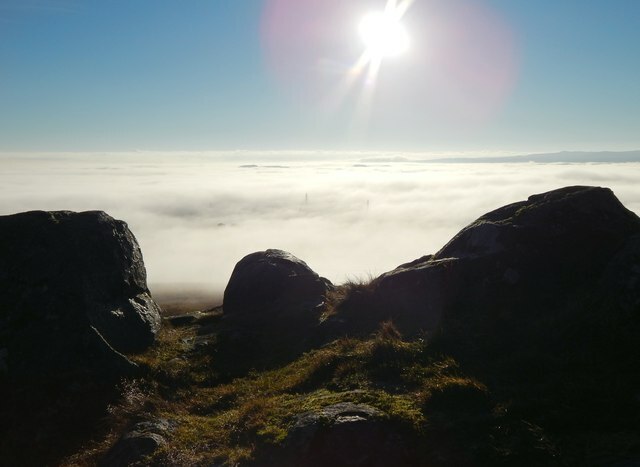 On days like this, when the summit looks out over a vast sea of mist, the hill still has a special feel. This large hill-fort — see Link (at Canmore) — was identified in 1954 from aerial photographs, and is thought to date from the Early Historic period (Dark Ages). See Link for a Geograph article on the fort. See Link for an annotated satellite view, and Link for other antiquities nearby.